The materials that constitute this website have been prepared by West Mayfield Borough for informational purposes only and are presented without any representation or warranty whatsoever regarding the accuracy or completeness of the information. Viewers of this website should not act upon this information without verifying its accuracy with West Mayfield Borough. The information contained in this website is provided only as general information, which may or may not reflect the most current information about West Mayfield Borough. Reference herein to any specific commercial products, process, or service by trade name, trademark, manufacturer, or otherwise, does not necessarily constitute or imply its endorsement or recommendation by West Mayfield Borough. West Mayfield Borough makes no guarantee, either expressed or implied, as to the timeliness of response to electronic mail, nor assumes any legal liability or responsibility for the consequences resulting from actions taken by recipients of replies to electronic mail inquiries. Links to information on websites other than those operated by or on behalf of West Mayfield Borough are for your convenience only and are not an endorsement or recommendation of those sites. West Mayfield Borough does not provide or control the content or information presented at these sites. West Mayfield Borough neither endorses nor is responsible for the accuracy or reliability of such content or information and any use thereof is solely at the user’s own risk. 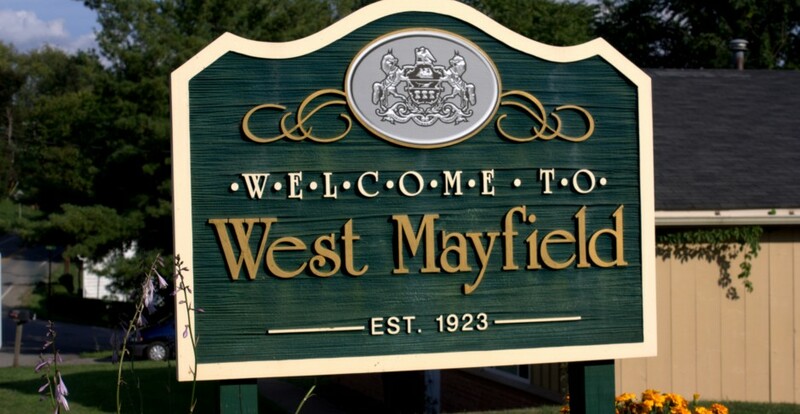 This website (http://www.westmayfieldborough.us) is the official website of West Mayfield Borough. Only this website and associated communication platforms https://www.facebook.com/WestMayfieldBorough and https://twitter.com/westmayfield may represent West Mayfield Borough. No other on-line entity, organization, or publication is authorized to represent or act on behalf of West Mayfield Borough. © 2016-2017 West Mayfield Borough. All rights reserved. The original text and graphic images on this site are protected under US and international copyright laws. Original content on this site may not be appropriated for commercial purposes without attribution and the express consent of West Mayfield Borough and/or the content’s creator. Contact the Website Administrator for more information.